For all collectors the Girzzly version vanished from the net but are now online again. The reason is that my old Joomla database was broken so I switched to the much easier WordPress. To download the latest version go to the Windows Edition page. There you can also find some information about the existing engines. New stronger versions are planned to be released later in 2015. Have fun using this engine. Dear Friends of Computerchess and Games! You’ll will find my new and old Grizzly Chess engine on these pages very soon. I hope to have version for iOS, Android, XBOX 360 and the PC of course. 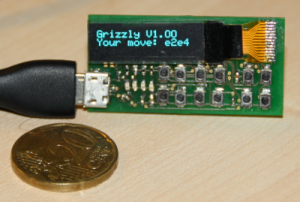 Another running project is “Grizzly Micro” a very small 20×40 mm Chess Computer with text display and 12 buttons. If I finish any other games for any devices I’ll surely post it here. Please give me some time until it is finished.